There are no metaphors or secret senses in this still life. I didn’t put them in and I did nothing to allow them to be seen there. But this doesn’t mean that there is no sense in this painting. 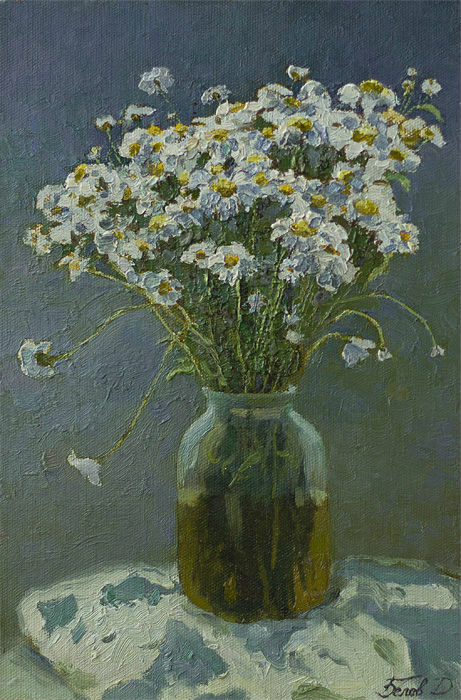 I just love daisies and this is enough for me to desire to paint them, and this is what I did when I saw the jar filled with them. I simply wished to make something so that the paint would stop being paint and would turn into the daisies, to depict the thing that attracted me to them, and do it so that I would be satisfied with the result myself!